Often, you may have a task that should be completed after a specific amount of time has elapsed, after another step is completed. You can set such relative deadlines in a blueprint. Relative deadlines feature (deadlines relative to other steps) is available on BASIC or PRO plans. Deadline will be set relative to the time the process started OR using the selected step's deadline/completion time. The visuals below walk you through how to do this for a 2 step process where the first step needs to be completed in 10 days and the second needs to be completed within 3 days of the first step being completed. 5. 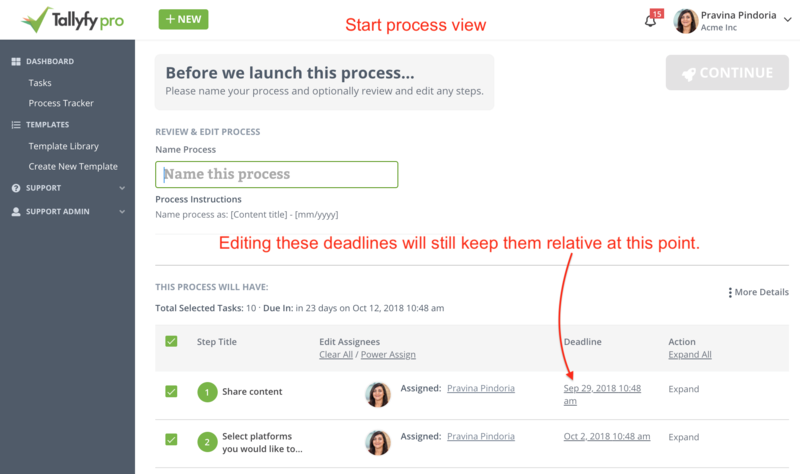 First you will see this launch process lightbox, select "Review & Edit Process Before Launching"
5. Start the process and you will see that the relative deadlines are applied. Please note that if deadlines are edited in the active process after they are assigned, the deadlines will not update in the related tasks. Manually updating a deadline before starting a process - Step relative deadlines rules will be retained and applied. Manually updating a deadline of a task after starting a process - Step relative deadlines rules will not be retained.